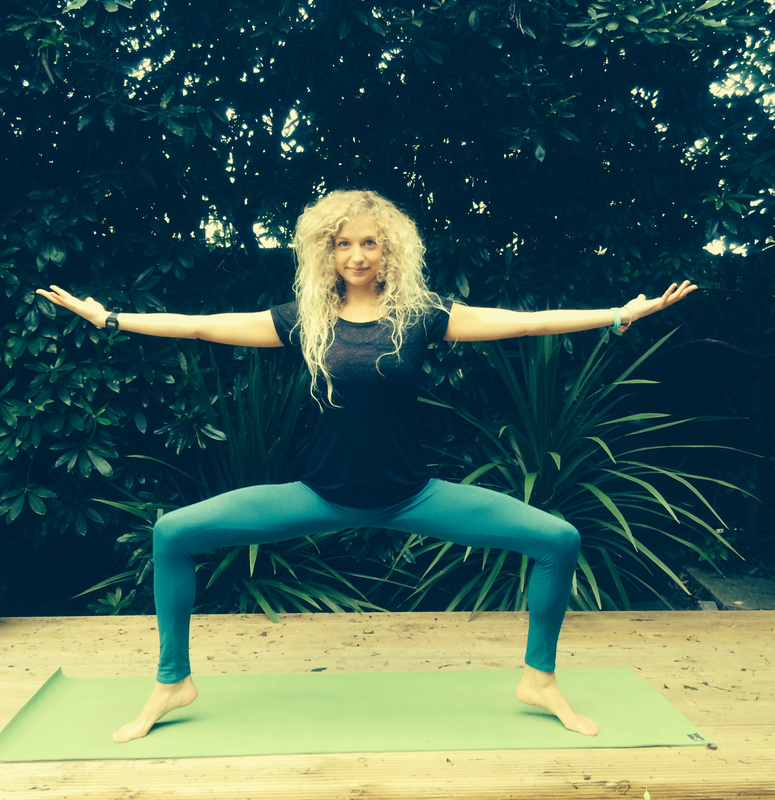 Practice: Utkata Konasana (Fiery Angle Pose / Goddess Pose / Horse Stance) + Why ‘New Year, New You’ Is Stopping Us From Loving The Body We’re In Right Now…. Turn the toes out diagonally; there’s no specific angle the toes should point out at, but ensure the knees are facing in the same direction as the toes to keep the ligaments stable and healthy. Bend the knees deeply; if you’re still building strength in the legs than take a small bend, but if you’re feeling good then lower the hips and see if you can move the thighs parallel to the floor. A great way to strengthen the muscles of the legs without fatiguing the muscles, is to maintain a slight pulsating movement through the lower body – lowering the hips up and down as the muscles of the legs contract and release. This will stop too much lactic acid from building up and you’ll be able to keep moving through your practice without feeling like your legs are on fire! Reach the arms out along-side the shoulders and turn the palms up to keep the chest open and free. Variations: I love teaching this posture with an added shoulder opener and core strengthener; for this variation bring the arms into the Garudasana position [[[[link]]]] and begin to make slow, snaking movements with the upper body. Yes it looks slightly strange, but you’ll be connecting to your deeper abdominal muscles, especially the transverse abdominis, which works to protect the spine and give us the support needed to move fluidly through your practice. To add more of a challenge in the lower body, either lift the toes to engage the arches of the feet and bring more activation to the quadriceps, or lift the heels from the floor to strengthen the calves. Either way the legs will probably start to shake…. Stay in the posture for 5-10 breaths, or however long feels good to you. Become aware of any gripping sensations in the shoulders or jaw, and soften any unnecessary tension that may have accumulated in these areas. To transition out of the posture, straighten the legs and bring the feet parallel. Step or jump the feet together and take a moment to notice any sensations arising after the posture. This awareness of how the postures actually effect us is just as important – if not more so – than the posture itself. Add postures like this into your daily practice this new year, and feel good in the skin you’re in right now!